We love round, classic engagements ring as much as the next person, but there's an underrated ring trend that has caught our attention: hexagon engagement rings. 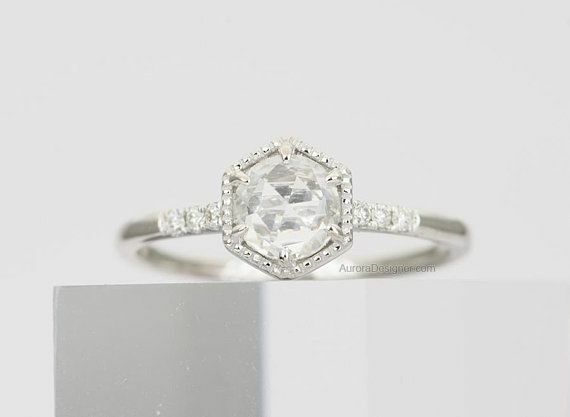 This geometric shape not only gives a one-of-a-kind allure, but it's also a fresh and modern take to the engagement tradition. Plus, in a market where design possibilities are practically infinite, hexagon rings can either be worn to be more eye-catching or you can opt for a subtler but still striking style. Whether it be a colored hexagon-shaped diamond on an X-shaped band or a classic style where the diamond is paired with other smaller hexagon-shaped gems, it's guaranteed that there's an edgy take on this engagement trend just for you. Below we've rounded up 25 hexagon engagement rings that you'll love now and each anniversary to come. Antique styles are also welcome. Available in sizes 3 to 11.5. This elongated hexagon shape looks so pretty on. Yellow gold meets yellow diamond. The diamonds will just glisten right off your finger. Available in sizes 3 and under to 9 and above. White diamonds are a classic no matter the shape. For those of the bigger-is-better opinion. Available in sizes 3 and under to 9. Available in sizes 3 and under to 12 and above. A pared-back version of the hexagon-shaped diamond that welcomes all the "I dos". A lovely touch of color. For someone who really loves that shine. Available in sizes 4 to 9.5. Opt for an X band. Intricate detailing is an option as well. For when one halo isn't enough. What's better than one hexagon-shaped diamond? Multiple hexagon-shaped diamonds. Available in sizes 3.5 to 9.5. Step-cut diamond rings are a good option too. Now it's time to say yes to the dress.